Snapchat has confirmed its acquisition of the software company AddLive prior to developing its own cross-platform video messaging service. The deal went through several months ago, and its conclusion is the latest classroom-disturbing Snapchat update. The startup took interest in AddLive's technology as it allows quick integration in existing products and a complete set of video features, such as screen-sharing, multi-party conferencing, browser-based video chat, and more. In an interview with The Verge, Spiegel explained that he envisioned Snapchat's upcoming video chatting capabilities in the same vein as the app's messaging functionality, which strives to emulate the fluidity and spontaneity of everyday casual conversations. "The essence of conversation... is just someone wanting to talk to you." - he said, explaining why the app discards many traditional metaphors of messaging services, such as read receipts, typing indicators, statuses, envelope animations, and the like. Furthermore, when both users are inside a chat, they are able to tap and hold on a new blue button. The friend's face appears on the other side of the conversation. There's no ringing or answer call. It's like a friend of yours showing up on your doorway to talk. Furthermore, if users want to show their friends something, they can activate their device's rear camera and go with it. The blue button in question is the new Here indicator - positioned next to the typing bar. It is designed to replace the typing status which is familiar from Skype. It works by showing up in the chat window when your friend's online, and sending a Push notification to your lock-screen if you are out of Snapchat, but someone has begun typing to you and wants to talk to you. 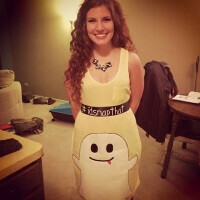 It seems Snapchat wants to once-again change the paradigms of messaging and messaging apps. Spiegel's vision, ambitious and broad, only reinforces this notion. He looks at a 25-year plan for the company, and Snapchat becoming an all-in-one communications tool which doesn't feel clumsy or overbearing. Although Spiegel and co. appear to be going a bit far ahead of themselves, after all, Snapchat is one of the few still independent startups out there. Not only it refused billion-dollar acquisition deals, but is also maintaining continous growth, and user activity which rivals that of Instagram. I haven't seen a woman with a white thing on her dress that large since Monica Lewinsky! I´m here just for the girl. She is hot!!! Lol @ Doakie.